S.A.F.E. Structure Designs — a leader in the design, engineering, and manufacturing of ergonomic maintenance stands, fall protection platforms, hangar equipment, portable field equipment, steel structures, and specialty tooling for all aircraft — has announced that it has collaborated with Blue Sky Network to include Blue Sky’s SmartOne C Satellite-Managed Asset-Ready Tracking System and Software to S.A.F.E.’s jet engine shipping containers, which includes two engine maintenance stands all in one. The jet engine shipping containers’ tracking system is very similar to the rotary-wing aircraft tracking system manufactured by Blue Sky Network. The customer, shipping and/or receiving, has the ability to track their jet engine containers in real time around the world. S.A.F.E. incorporated a tracking system as a safety precaution for its customers in the loss of a jet engine during transport. 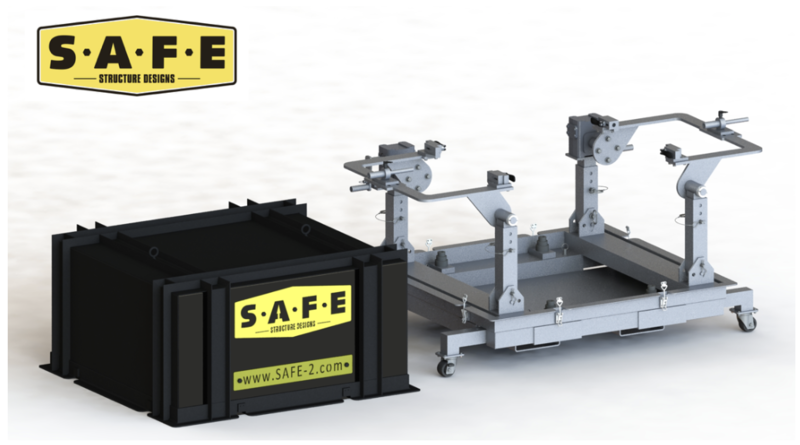 With the use of this safety solution software, S.A.F.E.’s customers may instantly access the location of their jet engine containers when they are not in use. The system provides real-time tracking of the asset, which allows the shipper/receiver the ability to monitor and establish on time delivery with the knowledge of possible delays. With S.A.F.E.S’ jet engine shipping container, the technician will receive the engine inside the shipping container, remove the lid, rotate the engine vertically into an engine stand working height position, and mount the second engine into the additional engine maintenance stand. Upon completion of maintenance, the mechanic is then able to insert the new engine into the aircraft, rotate the old engine horizontally back down into the container, seal the lid with quick locking latches, and ship it off.